You'll find all shapes and sizes of Christmas tree clip art from the simple to the outrageous. Whatever you're looking for, you'll be sure to find it here. These Christmas tree clip art images are all free for you to use for any personal project but you'll need to check the terms on each website if you'd like to use them for more than that. After you've searched through all these free Christmas tree clip art images, be sure to browse through my lists of Christmas clip art, Santa clip art, and Christmas borders. There are tons of other Christmas freebies you might like as well such as letters from Santa and Christmas coloring pages. This Christmas tree clip art image shows an ombre green tree decorated with bright red ornaments and a golden star on the top. 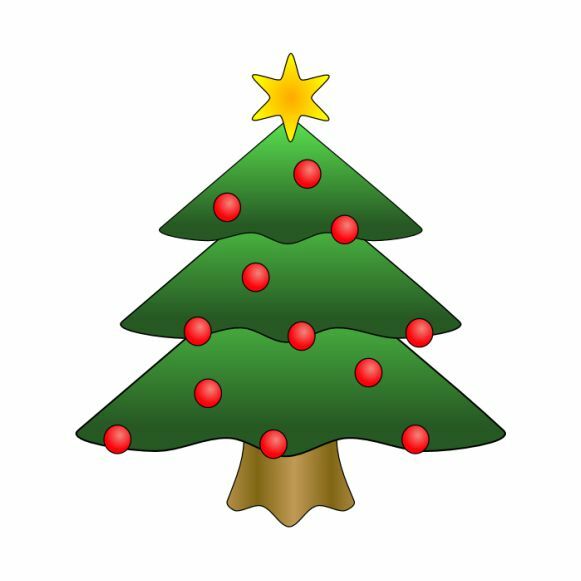 There are almost 80 other Christmas tree clip art images here just waiting to be downloaded to use on your next holiday project. Here's a decorated Christmas tree clip art image that incorporates the colors of red, blue, and gold to make a beautifully decorated tree. It can be downloaded in the color version or as a black and white image. These are some really wonderful and unique other Christmas tree clip art images you should check out as well. 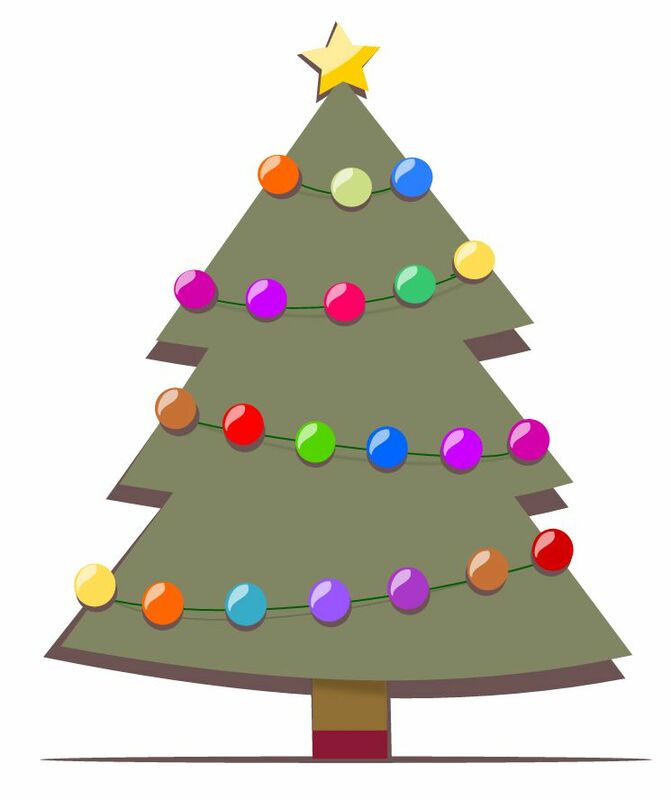 Here's a modern Christmas tree clip art image that has a string of multi-colored lights going around the tree with a small yellow star on the top. To download, click on the thumbnail and then use the red download button to get the largest clip art image available. OpenClipart has more than 100 free Christmas tree clip art images that include fresh-picked Evergreen trees, decorated Christmas trees, vintage trees, and everything else in between. These are high-quality, large Christmas tree images that look great. This Christmas tree clip art image is all ready for the holidays, decorated with bulbs, stars, and handmade ornaments. All it needs is some gifts under it! Before downloading, you'll be able to see the size, file type, dimensions, views, and downloads. With 70+ free Christmas tree clip art images available, Clipart Panda is a great place to visit for Christmas trees that are snowy, bare, decorated, and even being visited by Santa. This Christmas tree clip art image plays on the whimsical feelings of Christmas past, with its colorful ornaments and bright yellow star on the top. There are 50+ other free Christmas tree clip art images here with a wide selection of Christmas trees that are decorated and evergreen trees. Santa's in some trouble, having to climb to the top of the Christmas tree to avoid an angry dog in this clip art image. Webweaver has two more pages full of Christmas tree clip art including some very fun animated images. Some of these images are quite small, but you can use your mouse and click them up to full-size before downloading.